[Register Here] Our 72.0 mile route is truly stunning with no bail-outs and 7690 ft of gain; it's a real test of any cyclist! As with the 100 milers, you’ll ascend Moody and Page Mill right out from the start, cross Skyline to descend the spectacular W. Alpine Rd to our famous La Honda Rest Stop! 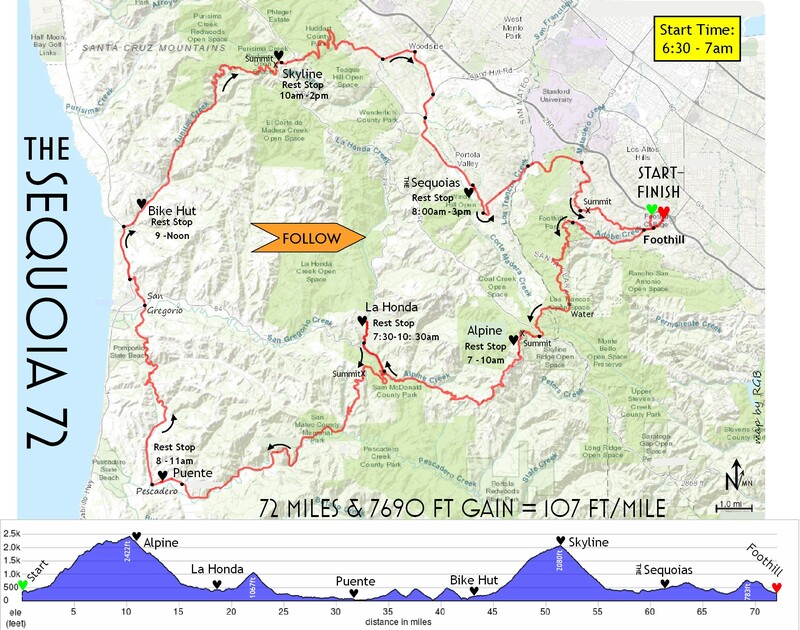 Still with the 100's you’ll climb over Haskins Hill and descend through miles of cool redwoods out to Puente in Pescadero for your third stop before turning north via Stage Rd. After drinking in the last coastal views, turn east and take a break at the Bike Hut Rest Stop to get refueled before your ascent of Tunitas Creek Rd and the nearly 2000 ft gain through miles of second growth redwoods up to Skyline. Your sixth and last Rest Stop is at a shaded site at The Sequoias, just 9.3 miles from the finish!